The The Humane Society of the United States estimates that there 86.4 million owned cats in the US (4.5 million in Canada), with fifty-two percent of owners own more than one cat. And with every cat comes a story, and probably pictures and video too. Purina Cat Chow has created yourcatstory.com to collect those stories from cat owners. Just create a story about your cat in 600 characters or less, (attach a photo or short video if you’d like), and select. Ten finalists will be selected for consumer voting with five Grand Prize winners being awarded $5,000 and a year’s supply of Purina Cat Chow. 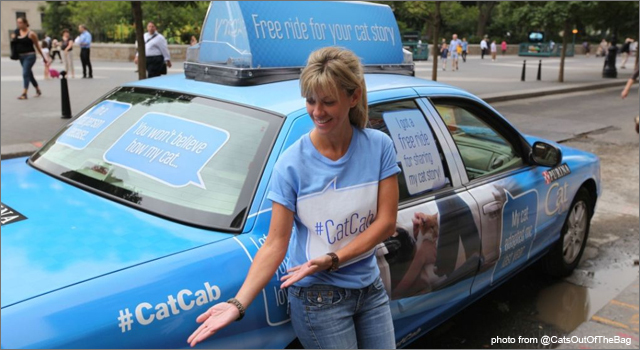 Purina launched the campaign in Manhattan, and for a week offered New York cat lovers a free cab in the #catcab in exchange for their cat stories.